A. Certainly - claro, and for this reason I believe it is impossible that the world could be so hardened as not to change. A. I really don't know. I think that five minutes would be an adequate time. A. No, unless it's something that results from the shock, for example, a heart attack. A. Yes, but I don't know the date when it will occur. Q. Did you 'see 'or 'hear 'about the Warning? Q. Many years ago you told us the event of the Warning begins with the letter "A. " Since Our Lady never told you not to reveal it, can you now mention it? A. She did not forbid it, but I don't know why I haven't said it and I don't feel as though I should say it now. Q. You once said to Fr. Marcelino Andreu, (When you see the Warning you will know we have opened up the end of time. " Can you explain what you meant by this? A. No. 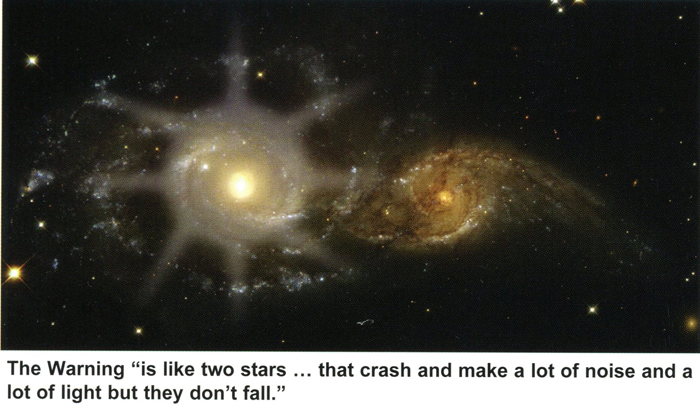 To me, it's like two stars... that crash and make a lot of noise and a lot of light but they don't fall... It's something that's not going to hurt us but we're going to see it. In that moment, we're going to see our conscience. You're going to see everything wrong that you're doing. Q. You 're going to see everything wrong that you are doing? A. Yes. And you're going to see the good that you're not doing. A. During an apparition — I don't remember just when—the Blessed Virgin told me. A. She told me all of this during one apparition. I don't remember now if she spoke about the Warning during any other apparition. A. ... Everyone will experience it wherever they may be, regardless of their condition or their knowledge of God... It will be an interior personal experience. It will look as if the world has come to a standstill, .. .no one will be aware of that as they will be totally absorbed in their own experience. A. It is going to be something like an interior feeling of sorrow and pain for having offended God. God will help us to see clearly the harm we are causing Him and all the evil things we do. He will help us to sense this interior pain because often when we do something wrong we just ask the Lord's forgiveness with our lips, but now (through the Warning) He will help us sense physically that deep sorrow. A. The way I saw it at the time, it was more like a big silence, like a sense of emptiness. Everything was very silent. That's the way I saw it. Q. You're the only one who knows the year of the Warning. Did you ever tell it to anyone else, like a priest for example? A. The Warning is something that is first seen in the air everywhere in the world and immediately is transmitted into the interior of our souls. It will last for a very little time, but it will seem a very long time because of its effect within us. It will be for the good of our souls, in order to see in ourselves our conscience, the good(1) and the bad that we've done. Then we'll feel a great love toward our heavenly parents and ask forgiveness for all our offences. A. The Warning is for everybody because God wants our salvation. The Warning is for us to draw closer to Him and to increase our faith. Therefore, one should prepare for that day, but not awaiting it with fear because God doesn't send things for the sake of fear but rather with justice and love and He does it for the good of all His children that they might enjoy eternal happiness and not be lost. Q. In the 1979 interview (above), you said in describing the communist tribulation that "it was like an invasion. " Did you see scenes of this invasion? A. If it is God's will. A. It is coming soon but I can't reveal it until eight days before the date. A. The Virgin said that everyone present would believe. They would see that this was coming directly from God. All sinners present would be converted. She also said that you would be able to take pictures and televise it. Also, from that moment on, there would be a permanent sign at the Pines that everyone would be able to see and touch but not feel. I can't explain it. Q. With respect to the sick people... the Virgin mentioned one particular person, a blind man called Joe Lomangino. What did she say about him? A. Yes. This priest came frequently to the village to see if the apparitions were real or not. After a while he believed in them. Once, while we were in ecstasy at the Pines, he began to shout, "Miracle, Miracle, Miracle." When this happened the Virgin said, "At this moment the priest is seeing me and the Miracle that will occur." A. Yes. That same day on his trip back home he said to his friends, "This is the happiest day of my life. What a great mother we have in heaven. The apparitions are true." As he said these words he died. Q. Didn 't the Virgin say that something would occur on the day after the Miracle concerning Fr. Andreu? A. I don't even know if I'm going. (Asked to expand on her answer, Conchita said): Surely I want to go, but I don't know if circumstances will permit. It is not necessary (for the occurrence of the Miracle) that I be there. A. I don't know exactly. Most definitely at midnight (eight days before the Miracle) I will call Joey (Lomangino), radio, television, and anyone else in the world that I feel can help to spread the word rapidly. I am not worried. I know that if the Blessed Mother wants you there, you will be there. A. For Joey to go to Garabandal is a good idea, but I don't know how long will pass between the Warning and the Miracle. Q. 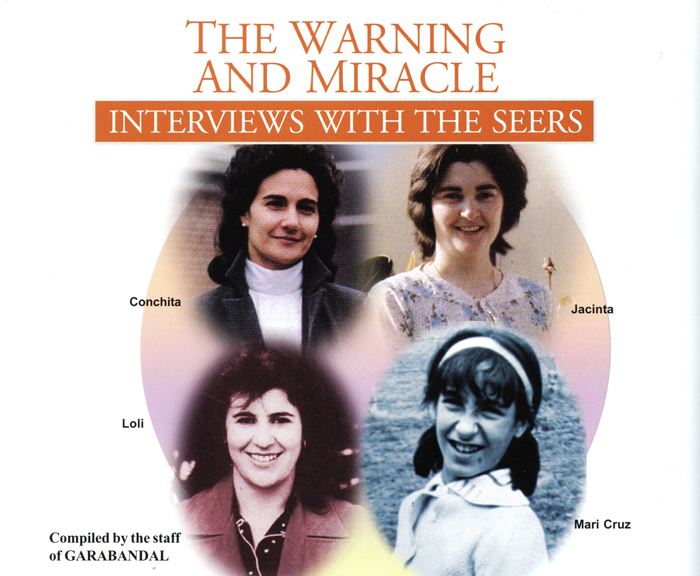 Did you 'see' the Miracle or were you told about it? A. Even if I would try to explain it, I wouldn't be able to do it well. It is better that you wait and see it. Q. 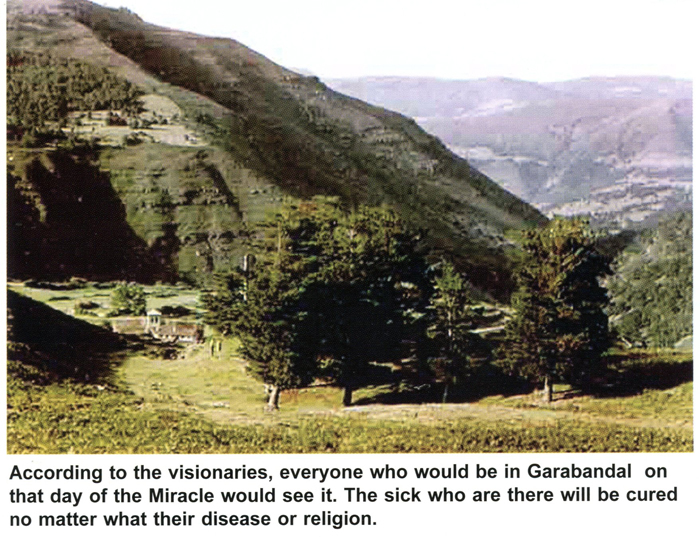 It is said by some people that the way you will announce the Miracle will be a 'miracle' in itself. Can you explain this? A. The Virgin didn't tell us anything about this. A. I don't know personally. It depends on those people; of their wishes, or their faith, or their sacrifice or their obedience.